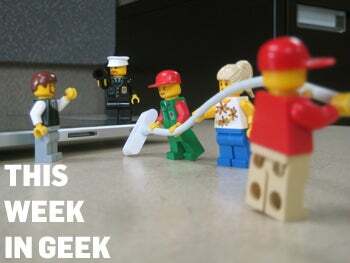 This Week in Geek: MacBook Updates, BlackBerry Tablets, and 3D on the Move! How many minifigures does it take to charge a gadget? MacBook Air Updates May Be On The Way - But Does Anyone Still Care? Rumor: BlackBerry Tablet Coming This Year? Could Research In Motion (RIM) be planning an entry into the now-hot tablet market? According to one rumor, hinting at a 8.9-inch device, they could well be. James Mulroy details what we know so far about the could-be tablet. Want to know how the world is feeling at a glance? A recent DIY project makes that a reality due to the power of Twitter. With a little free time, an RGB LED and some other geeky goodies and you too could be getting a feel for the worlds' mood in an instant. Feeling blue? If you want more geeky goodness then be sure to follow the GeekTech team on Twitter and become a fan of the GeekTech blog on Facebook.